In October of 2010 Sweden’s National Veterinary Institute discontinued their production and distribution of blood products. A newly formed company, Håtunalab AB, bought the division called “blood products” from the institute. All personnel were offered to stay with the new company, continuing their work. Håtunalab AB also took over all the residing animals. Thus, the activity continued in the form of an incorporated company. This means a number of animals continuously donate blood for production and sales of blood, serum and plasma. The animals currently donating blood at Håtunalab are horses, cows, sheep, guinea pigs, rabbits and chickens. 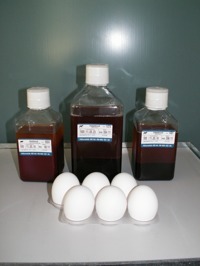 The chickens also provide eggs for laboratory use.